Poiana Brasov skiing has been the highlight of my teenage years. That’s where I started and got hooked little by little. For over 15 years however we’ve been skiing all over Europe, spoilt in the French, Swiss and Italian Alps, so perhaps my enthusiasm for Poiana Brasov ski holidays has been tested and slightly tempered. But with a baby in tow (and thereafter two) and grandparents keen to see them, we have been persuaded to go back on regular basis. On the first occassion, right after 5 months filled with warm holidays, R was introduced to the proper winter and the snow: so here we go, Poiana Brasov skiing with a baby! 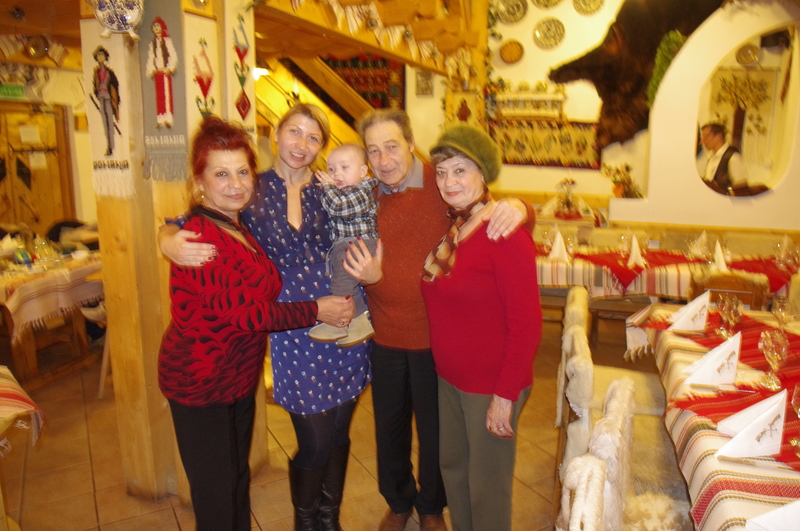 Mum, dad, friends and family back in Romania were delighted! Bucharest was white when we landed. Friends travelling left us a flat, some others gave us a car and friends with kids arranged for a travel cot for the 10 days period – always appreciated to have such a warm welcome & support. Bucharest is not particularly baby friendly in winter – stick to a sling, car and baby car seat for most of the occasions (and for more tips on Bucharest with kids, head to our dedicated article in here). A 3 hours drive from Bucharest (traffic permitting) one is in Brasov and thereafter, add another 25 minutes, in Poiana. On the first occassion, we haven’t been skiing in Poiana for many years, probably over 8 exactly. Friends marketed occasionally improved skilift infrastructure and no longer the queues that we grew up with (potentially up to 40 minutes for a 10 minutes descent). And whilst during the week we’ve seen some improvements, we haven’t been quite swept from our feet. The snow at the beginning was relatively decent but the winds somehow meant the cable car wasn’t working. The other days the spring decided to come and all of a sudden we had over 10 degrees, which meant skiing on a funny texture watery mud and artificial snow. But we did manage to catch two mornings and one afternoon skiing in 5 days, sipped some beers on sunny slopes and enjoyed the mountain smells and refreshing silence. On the consecutive February half terms we have been luckier though weather wise! On average I content myself with 3 full days of skiing week time as afterall the slopes options are to be counted on 1 hand: 2 blacks – Lupului and Sub-teleferic, 1 red – Sulinaru, 2 blues – Rosu & Bradului (the latter is for kids and beginners only). As long as you manage expectations – this is not Italy, France or Austria afterall in terms of variety and numbers of slopes; you are relatively fine. The first time round with baby R we picked a new boutique hotel next to the ice ring, conveniently located 5 minutes from the slopes – Rizo. Their apart options were great to allow parents to ski and still be in 15 minutes reach should the grandparents need us, baby to sleep lunch time and evenings and nights in its cot, whilst parents were socializing in the living area. We had few friends over, sometimes went to the restaurant, sometimes we were just next door. Rizo boutique hotel had also some good food options, some traditional Romanian dishes and few decent oriental ones. The other guests were quite diverse, some Romanians, some Israelis, some Russians and other Eastern Europeans. Few other good hotel options for parents in need of a kidsclub, Ana hotel or Hotel Teleferic. Both have ski schools attached as well as spa facilities and restaurants – no need to go out for breakfast or dinner. Baby R enjoyed the grandmothers company, went for walks in the pram and laughed his head off of their silly tricks. We also started weaning him in London couple of days before we left, so for the trip we brought with us a freezer bag with lots of frozen homemade vegetables fish pots. It worked out very well, with fresh fruit grated and homemade little recipes with protein – all v convenient to carry around and feeling good about the baby diet even when travelling (the freezer bag lasts 20 hours at normal temperatures which was ok for short drives and was kept in the freezer from the minibar). Baby E overall has been less enthusiastic about snow and winter, but keen on company and walks in the forest. No trip to Poiana is complete without a visit to Coliba haiducilor. And this is one charming place where we always feel looked after, age regardless – baby, toddler, kids and grandparents. Service is prompt and warm, food authentic and traditional Romania, typical mulled wine and tuica flowing. The other favourites, oldies and goldies are Sura Dacilor and Stana (about 3.5km / 10min drive from Coliba). Brasov is also 13km away/ 25 minutes drive and has some fantastic gourmet restaurants in Brasov – many children friendly; charming German looking centre town with cobbled streets and colourful houses; medieval fortress, towers and century old churches. Winter time there are also lovely winter markets and decorations everywhere – properly fairy tale looking like in the snow. Head to our Brasov with kids article for more tips. For more Poiana Brasov skiing with kids, head to our dedicated article on Romania ski holidays in here.